Life is fast and we are all too busy working. But despite the daily grind, we still want to meet our friends while we grab something to eat, maybe see the works of young artists or buy something that appeals to our taste. As there is never enough time, we cannot do all these things. Thanks, however, to the increasing number of art-friendly cafes and restaurants or galleries, which enable people to take a break from the rush of life, art and food are served in one place. You can take a sip from your aromatic coffee, buy a new piece for your house or just observe the art decorating the walls, the choice is yours. Located in Gayrettepe, Muse Istanbul was founded by the Bergsen Family in 2012. Defined as a "collective shop" by its owners, as it brings different art branches together under the same roof, Muse/Petra is home to Petra Roasting Co.'s headquarters which is one of the New Age artisanal coffee makers and its coffee laboratory. The same building also hosts the Bergsen & Bergsen Gallery and a shop that sells handmade ornaments, notebooks and custom-design products by Aida Bergsen. "We started this project with the things that we love the most and wanted to create a space to inspire people. That is why we named the shop 'Muse,' " the owners of the shop tell us. The gallery inside the shop also provides a space to independent artists. It is possible to see on the walls the works of many young artists ranging from Antonio Cosentino to Özgür Korkmazgil and to purchase them. Moreover, the art works are not the only items on sale; the classical automobile and the speedboat at the entrance can also be purchased. The coffee shop/gallery has many loyal customers. The menu features filter and espresso-based coffees as well as healthy snacks from Gram. The shop is open from 9:30 a.m. to 7:00 p.m. on weekdays, and from 10:00 a.m. to 7:00 p.m. on the weekends. The shop is closed on Mondays only. Armaggan Gallery was opened by Yalçın and Serpil Ayaslı in Nuruosmaniye in 2011. The building is actually a shop that plays host to different functions. Besides Nar Restaurant which serves dishes from Anatolian cuisine on the building's fifth floor, there is also a show kitchen and conference halls. Moreover, a shop that sells textiles, jewelry and leather products offers its services to customers in the same building. Armaggan Gallery only displays the works of independent artists and hosts temporary exhibitions. So far, the gallery has showcased the works of Betül Cankara, Şifa Girinci, Emre Kantaşlı, Şevket Arık, Güneş Özmen, Sinem Kaya, Neşe Çoğal and Nilgün Sabar. Apart from the temporary exhibitions, part of the Ayasyalı Family's private collection featuring Devrim Erbil, Şeker Ahmet Paşa, Fikret Mualla, Sabri Berkel, Judy White, İbrahim Çallı, Feyhaman Duran, Hüseyin Rıfat Çeteci, Elif Naci and Birsel Mete is also displayed. Nar Restaurant offers elegant service during the evenings. The rich restaurant menu is decorated with dishes specific to Anatolia. The gallery is open from 9:00 a.m. to 7:00 p.m., except for Sundays. Nar Restaurant serves its delicious meals every day from 12:00 p.m. to 12:00 a.m. 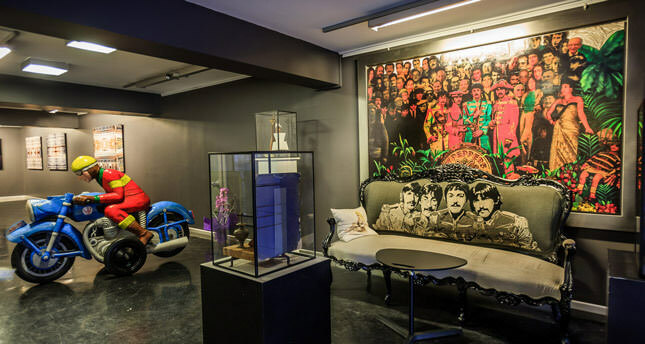 Founded by Argun Okumuşoğlu, Gallery 44A which has been hosting art lovers in Teşvikiye since 2008, opened a café recently. The manager of the gallery, Hazal Emre, said that they decided to add a cafe to the gallery in order to spread their love of art. "We decided to open a cafe in front of the gallery to bring the sociable side out in people, to increase the interest in art and to create a space for improvement. The purpose of the cafe is to develop new material for our gallery by being inspired by other people. It is a kind of investment in art," she said. Over the last seven years, the gallery has hosted nearly 40 solo and group exhibitions. Erhun Şerbetçi's photography exhibition can be also viewed until Feb. 25. The art world decorating the walls of the cafe changes constantly. Currently, customers enjoy the works of Argun Okumuşoğlu, Arzu Başaran, Sevinç Altan and Ahmet Elhan. The cafe puts a great deal of thought into their cafe just as they do into the art works. The shop serves two different coffees that were created by blending three different coffee beans. The menu also features homemade desserts and salty cookies. Art lovers as well as people of every age who want to enjoy the rare natural beauties in Nişantaşı, take a sip from their coffee, socialize or read a book, can visit the coffee shop everyday between 8:00 a.m. and 8: 00 p.m.
Agah Uşan and Yosrie Jacobs opened the Twins Coffee Roasters in Gümüşsuyu in 2013. The cafe hosts a different artist every month. Displaying the works of Sıla Yalazan, Mustafa Aslan and Ceren Demir, the coffee shop will present a brand new project in the upcoming month. Those who want to see the digital photographs reflected on the walls after visiting hours must visit the shop in the evening. Twins blends its own coffee and also serves cookies and herbal teas. The cafe is open from 8:00 a.m. to 8:00 p.m.
Ops Cafe in Karaköy was opened in 2012 by a long-distance captain, Yasin Kalender. Mixing industrial walls with bright colors and rustic wood with metal, the place was designed by architect Esin Sözer Kalender. The walls of the place are ornamented with art pieces by different artists every month. Hosting about 10 exhibitions so far, Ops Cafe has recently hosted "Employee Exhibition" by Bulut Reyhanoğlu, and the total income was donated to "Make a wish-Turkey," a charity organization aiming to fulfill the wishes of helpless children. This bistro of 30 people is preferred especially for its breakfast. Opening at 8:00 a.m. every day, Ops closes at 8:00 p.m. from Sunday to Wednesday, and at midnight on Friday and Saturday. Being a popular spot for nightlife, Lucca, a venue for art lovers, was opened in 2004 by Cem Mirap. Lucca was named after a medieval city in Tuscany, Italy. The service starts with breakfast in the morning and continues until 8:00 p.m. Lucca also has an art project called Lucca Art, which has hosted many different exhibitions and draws art lovers together for different exhibitions every month. Lucca now hosts an exhibition called "Celebration&Memories," in which art pieces that were created especially for the place are exhibited until Feb. 15. The exhibition includes art pieces by Aslı Sungu, Alper Aydın, Burak Ata, Eylül Ceren Ersöz, Çağrı Saray, Erdal İnci, Mustafa Albayrak, Sabo and Sadık Arı.